A biography of a sports network may not sound like good source material for a big-screen movie, but, as our own Mike Bracken noted two years ago, The Social Network didn't sound that intriguing, either, until Aaron Sorkin and David Fincher got their hands on the story of Facebook and made it awards worthy. In that light, news that ESPN: Those Guys Have All the Fun, a movie about the development of ESPN, is moving forward deserves further consideration. Several months ago, Fox decided not to move forward with it, and Focus Features picked it up and has secured an indie maverick with a very good track record to direct. After going into a huddle, we've decided it's a good thing, and here are three reasons why. Derek Cianfrance has been named as director. If his name isn't familiar, his movies might be: the romantic drama Blue Valentine, featuring Ryan Gosling and Michelle Williams as a couple in crisis, and The Place Beyond the Pines, a crime drama staring Gosling, Eva Mendes and Bradley Cooper. He also has extensive experience in TV and recently completed the documentary Cagefighter. Cianfrance's two fictional feature films have not been aimed at the mainstream, but they both allowed plenty of space for terrific performances by high-quality actors, which indicates the director will be able to attract good talent to the ESPN movie. Also, we're guessing that Cianfrance is not only a big sports fan, but also has strong ideas about how the script should be developed and shaped; he's a writer himself, though he's only being tapped here as director, at this point. As Ron Howard shows in Rush, set in the highly competitive world of Formula One racing in the 1970s, period films offer rich opportunities for modern filmmakers. 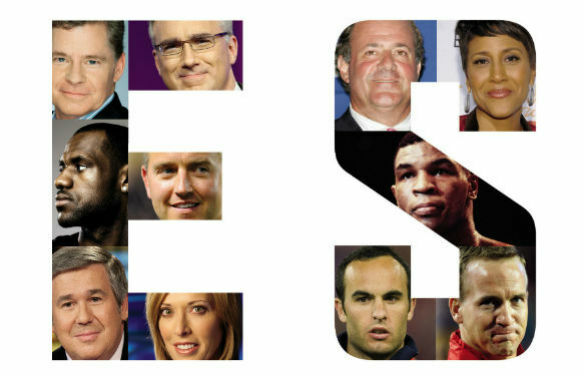 ESPN was formed in 1979, and the source material for the movie, an oral history by James Andrew Miller and Tom Shales, covers the development of the network over the years. We're betting that a movie will spend considerable time in the early 1970s and 1980s, which means there will be period fashions and cultural references that can be mined for dramatic purposes and comedic relief. And the ESPN story will undoubtedly take be different from, say, David O. Russell's American Hustle or the sequel Anchorman 2: The Legend Continues, two upcoming movies that are set in the late '70s and '80s. As a big bonus, the ESPN movie can also draw from the 1990s and more recent years, giving it greater scope and far more possibilities than movies restricted to a specific year or era. The book that serves as inspiration is an oral history, which means it consists of a series of interviews -- more than 500 were conducted, in all -- which means that the screenwriter (still not determined) will have to shape the material into a narrative story. But what great stories they are to be told! As a synopsis at Amazon states, there are "scandals, rivalries, offscreen battles and triumphs ... From the unknown producers and business visionaries to the most famous faces on television, it's all here." Because so many of the characters are lesser known people, it should be much easier for a movie version to establish its own crazy crew of sports fanatics. As a small hint of what's truly possible with a great collection of stories, look beyond The Social Network to a little TV show that lasted barely two seasons: Sports Night, which followed a cable sports network that was competing against giants like ESPN. And who created that show and wrote most of the episodes? None other than Aaron Sorkin.